Ammocharis tinneana, leaf spread right in the start looks as is a pack of cards is being suffled. Origin and Habitat: The range of Ammocharis tinneana includes a large number of sub-Saharan countries including Rwanda, Zaire, Chad, Ethiopia, Somalia, Sudan, Kenya, Tanzania, Uganda, Angola, Malawi, Mozambique, Zambia, Zimbabwe, Botswana, and Namibia. Altitude range: It is locally common at lower altitudes up to c. 200 metres above sea level. Habitat and ecology: Ammocharis tinneana occurs on a variety of soils, often on rich sandy alluvium, frequent in open deciduous woodland, particularly associated with Mopane, Baobabs or Combretum spp, where it may form small colonies. Description: Ammocharis tinneana is a perennial herb, growing from a very large underground bulb with a distinct aboveground neck, similar in appearance to Boophane. Leaves in a basal rosette, invariably with a "cut-off" look, due to grazing by wildlife or cattle. Flowers in a large teminal umbel, pink to carmine with white stripe on inner surface of petals, fragrant. In this species the stalk (pedicel) of the individual flower is about 1 cm long while in Boophane these measure several cm. Bulb: Up to 12 cm in diameter, with a distinct neck. In cultivation the remarkable bulb (sometime improperly called a caudex) is usually raised above the soil line so that this can be seen and more readily appreciated. For best results the bulb must be exposed only when the plants become mature enough, usually after several years (5-8 or more years) of underground growth, as the exposed bulb will no longer increase in size once it has been lifted above the soil line. 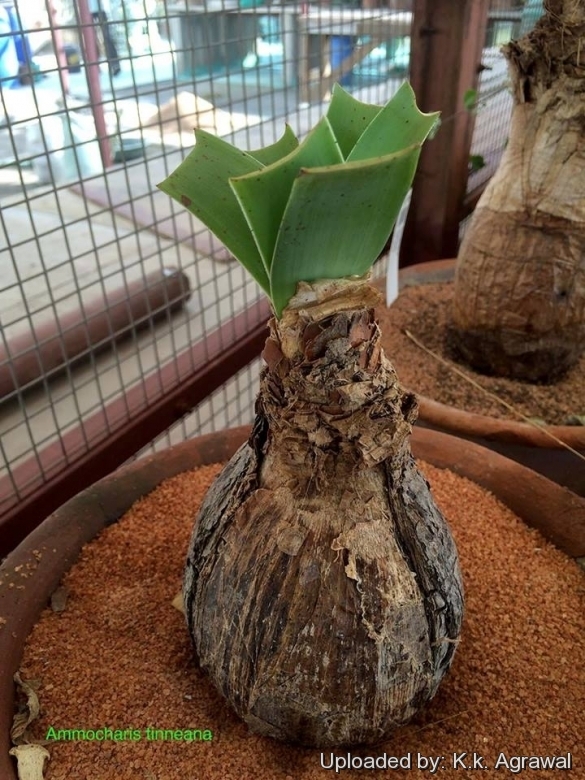 In very old plants, the bulb can achieve massive proportions, so keep a plant for many years to grow an unusually large “caudex”. Leaves: spreading on the ground in two opposite fans, 1–3 cm wide, length varying with age, appearing before to after the flowers. Inflorescences: 10–30-flowered on 5–25 cm long scapes. Pedicels 1–4 cm long. Flowers: Pink fading to magenta with age, or white, sweetly scented; tube 6–10 cm long; segments 4–8 x 0.3–0.5 cm, spirally recurved towards the apex at anthesis. Stamens slightly spreading, pink or white, 3–6 cm long; anthers 4–9 mm long, curved. Fruit: Reddish, subglobose, 2–2.5 cm in diam. 2) Craib C. and Brown L. "The Ecology of Ammocharis tinneana near the Limpopo River in South Africa." Herbertia 53:90-92. 3) Hyde, M.A., Wursten, B.T., Ballings, P. & Coates Palgrave, M. (2014). "Flora of Zimbabwe: Species information: Ammocharis tinneana." Exposure:It is most suitably grown in semi-shaded but it will even grow and bloom in full sun. Garden uses: In warm and temperate climates grow it in sunny courtyard gardens, in raised beds and rockeries. In countries with cold winter climates, they are best grown in containers in a cool or slightly heated greenhouse. The plants are mostly grown by specialist bulb collectors, usually as container subjects. Traditional uses: Snakebite antidotes. A sap extracted from its roots is used in preparing snakebite antidotes. Active Ingredient: Its root's sap.